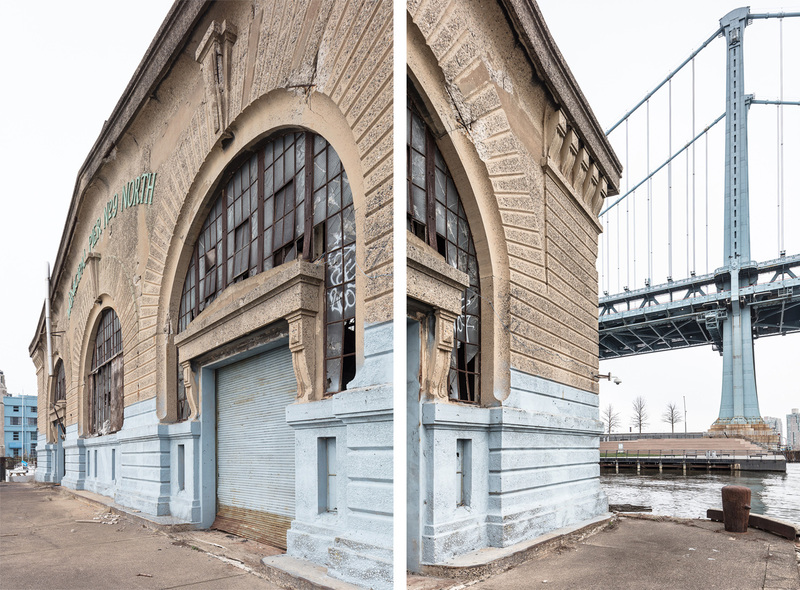 The history behind the creation of Municipal Pier 9, now Cherry Street Pier, is deeply embedded in the golden age of Philadelphia’s industrial past and rooted in the vibrant neighborhoods and commercial corridor that once characterized life on the Delaware River waterfront. At the beginning of the 20th century, the Philadelphia Department of Wharves, Docks and Ferries began constructing municipal piers on the waterfront as a part of a progressive-era project to upgrade Philadelphia’s neglected port infrastructure. Before the Department of Wharves, Docks and Ferries was created in 1907, Philadelphia had just over 20 piers on the Delaware River, most of which were owned by private companies and too small to accommodate larger cargo ships. Dozens of new, more structurally-sound piers commissioned by the Department of Wharves, Docks and Ferries were designed to accommodate larger ships, enable the loading and unloading of more than one ship at a time, and better facilitate the transfer of cargo to railroads, trucks, and wagons. Along with the new piers, the city proposed dredging the river to a depth of 35 feet and the construction of the Benjamin Franklin Bridge. The new piers, including Municipal Pier 9, served as marine-railroad terminals linking the Delaware River to the Pennsylvania, B&O, and Reading railroad yards. They were meant to serve as grand gateways to the city, constructed as two-story metal sheds topped with monitor roofs and catwalks. The head houses facing Delaware Avenue were made of poured concrete and decorated with arched entrances, baroque pediments, and rusticated bases. Each of these piers could accommodate ships up to 500 feet long, which in the early 1900s meant a large cargo ship or a small passenger liner. Their cranes were capable of hoisting up to five tons of cargo. When construction finished in 1919, Municipal Pier 9 was considerably larger than any other piers previously constructed by the city, measuring 100 feet in width and 535 feet in length. Along with other municipal piers along the river, Pier 9 was a vital part of Philadelphia’s shipping and trade community until the industrial waterfront’s decline in the mid-20th century. It is is one of the few surviving examples of the early 20th century Philadelphia piers, and the only remaining pier with its historic head house in tact. 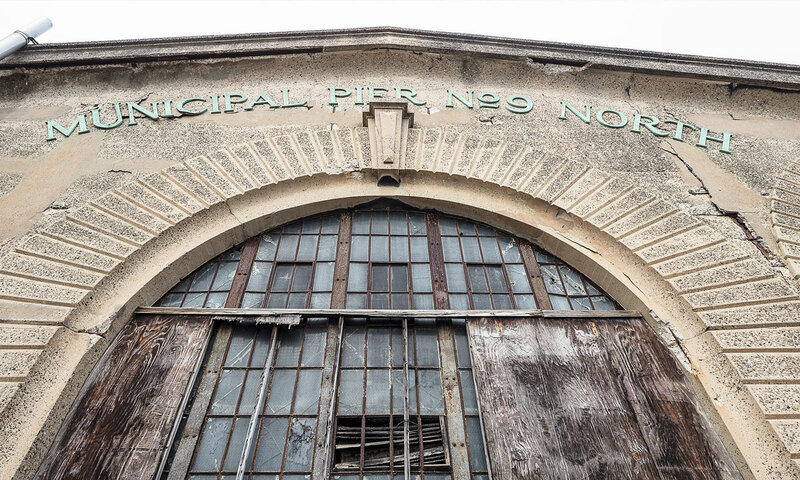 Municipal Pier 9 sat vacant for decades before finding new life as Cherry Street Pier. The Delaware Waterfront Corporation—along with our design and construction team and generous sponsors—has carefully repurposed the Pier, creating a fine balance between preserving the historic and beautiful original structure and providing a vibrant, multi-faceted new public space for all Philadelphia residents and visitors to enjoy. Adapted from the Feasibility Study of Pier 9, published by Bohlin Cywinski Jackson in April 2012.